I remember watching some episodes of John en Marsha in our old Nivico TV (yup Nivico, precursor of JVC). 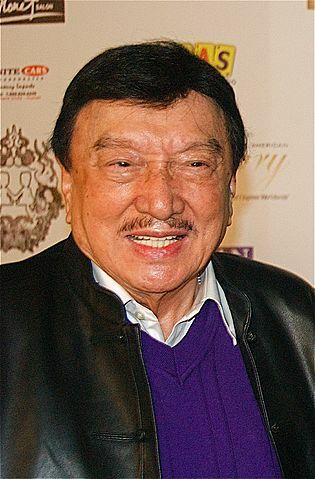 I know Dolphy as John Puruntong. Of course with Marsha, Shirley, Rolly, Donya Delilah and Matutina. I remember the famous line “John, magsumikap ka!! !” and how Donya Delilah keeps on “belittling” John and how she and Matutina keeps their pile of extra cash inside their carpet/rug in the sala. I remember him more as Mang Kevin of Home Along da Riles. Along with his love story with Ason (hehe, how Aling Ason will make romantic advances to Mang Kevin). I also remember the daily parenting life with Bill, Bob, Bing and Baldo. Maybe because this period was my TV “addict” years. Or maybe because I am one of the “real” Home Along da Riles (my officemates-slash-teleconference-mates can attest to that). One memorable Dolphy movie for me was an old one: his Once Upon a Time movie. He played half-human, half-tikbalang that switches from one personality to another by means of a clap (one clap for turns to tikbalang another two reverts him back to human). I know Richard Gomez and Chuckie Dreyfuss are part of that movie and further reading in the net about Once Upon a Time movie reminded me that Janice De Belen, Anjo Ylanna and Joel Torre was part of the cast too. Read more about the Once Upon a Time movie Dolphy movie here. Dolphy, Pidol, Golay, John Puruntong, Mang Kevin, you will be missed! Thank you for all the laughter! Thank you for all the happiness you gave us! May your soul rest in peace!